Irish airports are due to reopen for normal operations from 1:00 pm (1200 GMT) after a six-hour closure due to ash from an Icelandic volcano, the Irish Aviation Authority (IAA) said Tuesday. An IAA statement said it had cleared Irish airports to open for full operations from 1300 hrs local time (1200 GMT). "Dublin, Shannon, Cork, Knock, Donegal, Waterford and Kerry may resume normal operations." 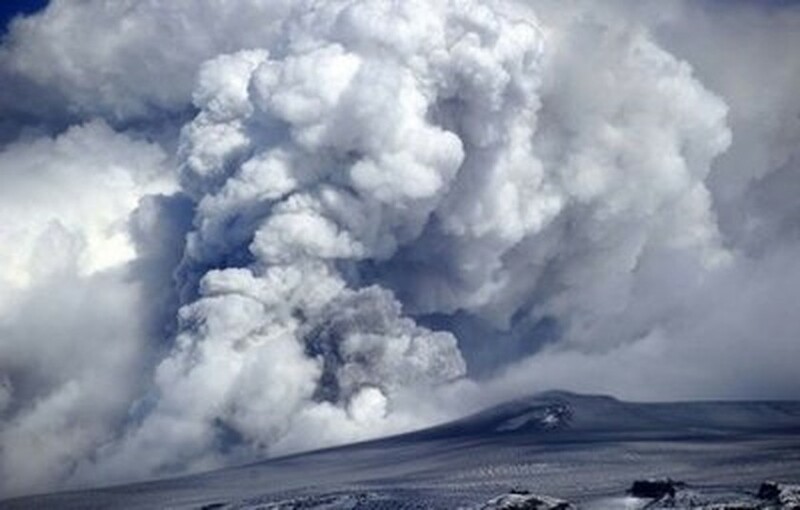 Smoke and ash billowing from Iceland's Eyjafjallajokull volcano in April 2010. Irish airports are due to reopen for normal operations from 1:00 pm (1200 GMT) after a six-hour closure due to ash from an Icelandic volcano, the Irish Aviation Authority (IAA) has said. Britain's Civil Aviation Authority (CAA) said airspace over Northern Ireland -- a British province -- would be closed from 0600 GMT. The flight cancellations should not disrupt aircraft overflying Ireland from Britain or Europe, or southern British airports including Heathrow, Europe's busiest air hub, authorities in the two countries said. The cloud of ash came from the eruption of Iceland's Eyjafjjoell volcano, whose drifting dust was behind last month's shutdown that left hundreds of thousands of travellers stranded across the globe. Airspace was re-opened after about a week following emergency talks between European governments, airlines and regulators. The IAA said all flights into and out of Ireland would be grounded from 0600 GMT to 1200 GMT Tuesday due to the dangers posed by the new volcano cloud. "The decision is based on the safety risks to crews and passengers as a result of the drift south of the volcanic ash cloud caused by the north easterly winds," said the authority in a statement. It added that "over-flights of Ireland from the UK and Europe will not be impacted tomorrow. Flights in mainland Europe will operate normally." Information from the London-based Volcanic Ash Advice Centre (VAAC) suggested that the ?no fly-zone' would affect Dublin and other airports across the country, said the IAA. Hundreds of flights were due to depart and fly into Dublin airport throughout the day, with more from Shannon and Cork in the south of the country and Ireland's smaller regional airports. Ryanair said it had cancelled all flights into and out of Ireland between 0500 GMT and 1300 GMT Tuesday. "The first wave is clearly one of the busiest parts of the day so it will have a fairly significant effect on the operation tomorrow," airline spokesman Stephen McNamara told the BBC. Irish flag carrier Aer Lingus said it had cancelled all British and European flights scheduled to depart and arrive into Dublin, Cork, Shannon and Belfast airports before 1200 GMT Tuesday. The international airline industry body, IATA, said last month's shutdown cost carriers some 1.7 billion dollars (1.1 billion pounds) and called on governments to pick up at least part of the cost, angered by their handling of the crisis. Eurocontrol, the continent's air traffic control coordinator, said more than 100,000 flights to, from and within Europe had been cancelled between April 15 and 21, preventing an estimated 10 million passengers from travelling.